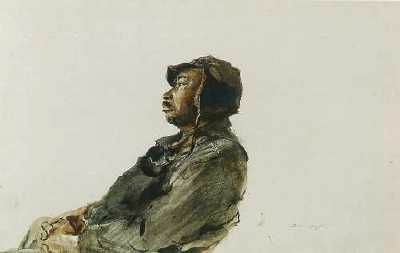 Andrew Wyeth: In Retrospect, a once-in-a-lifetime exhibition of iconic works by this master painter, commemorates the centennial of the artist’s birth. It will include over 100 works spanning his entire career, from the early works that quickly established his reputation to his final painting, Goodbye, completed months before his death in 2009. The Brandywine is the only East Coast venue for the exhibition and the only location where visitors can immerse themselves in the world of Wyeth through tours of his studio and Kuerner Farm. Public tours of these locations add insight to his work offering an intimate look at the personal space of this very private artist and an opportunity to see the farm, which inspired nearly 1,000 works of art. Wyeth’s life extended from World War I—a period that sparked the imagination of the artist as a young boy—to the new millennium. He once said that painting to him was “following a long thread leading like time to change and evolution.” This comprehensive retrospective follows that thread over the decades as it unwinds, progressing forward and at times altering course. The exhibition will offer new interpretations of his work, noting the significance, for example, of such influences as popular film and images of war, and on the relatively unstudied but numerous portrayals of African Americans from the Chadds Ford community. 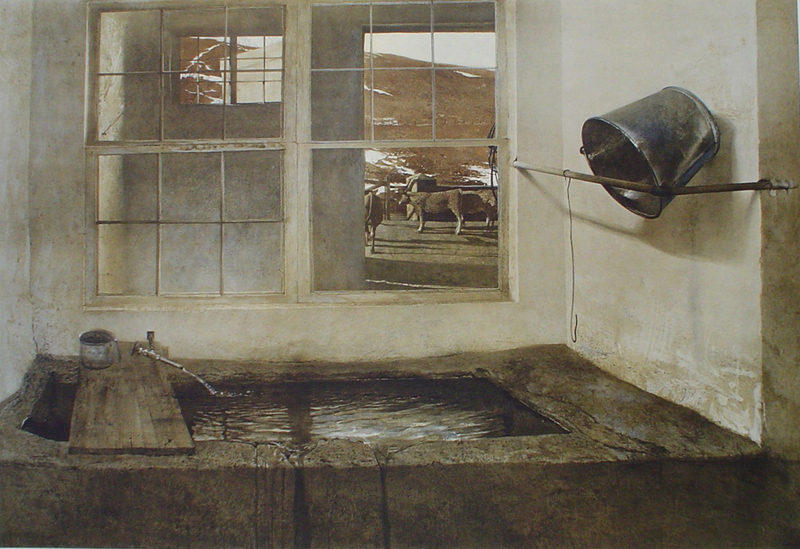 Visitors will also be given a view into Wyeth’s working process through studies rarely exhibited in the artist’s lifetime and through comparisons of Wyeth’s widely divergent approaches to watercolor—which inspired him to paint quickly and with abandon at times—and to tempera—a more controlled medium in which he built up paint slowly and deliberately. 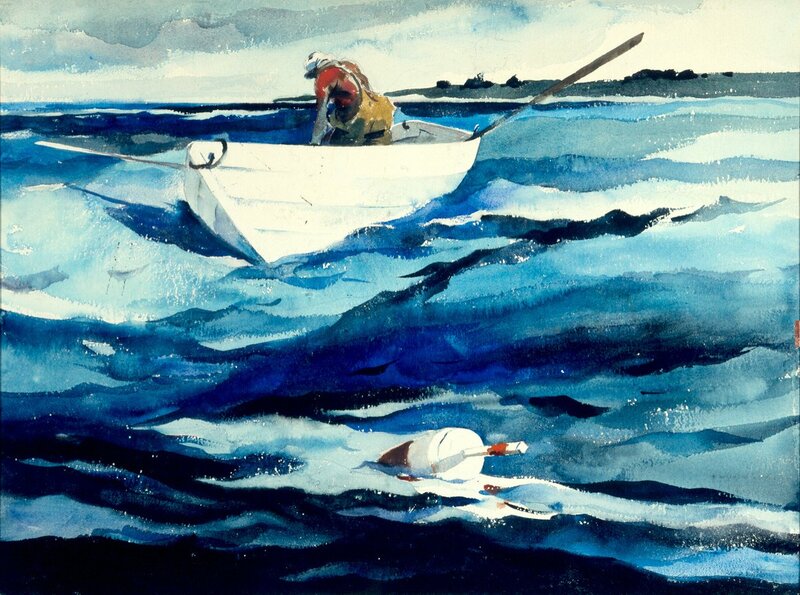 1935-1949: This section looks at Wyeth’s emerging presence in the art world—from the colorful, expressive watercolors of the Maine coast that reveal a debt to Winslow Homer and brought him to the attention of the art world in the late 1930s, to his early forays into the medium of tempera, and to the powerful, dramatic works of the mid to late 1940s. 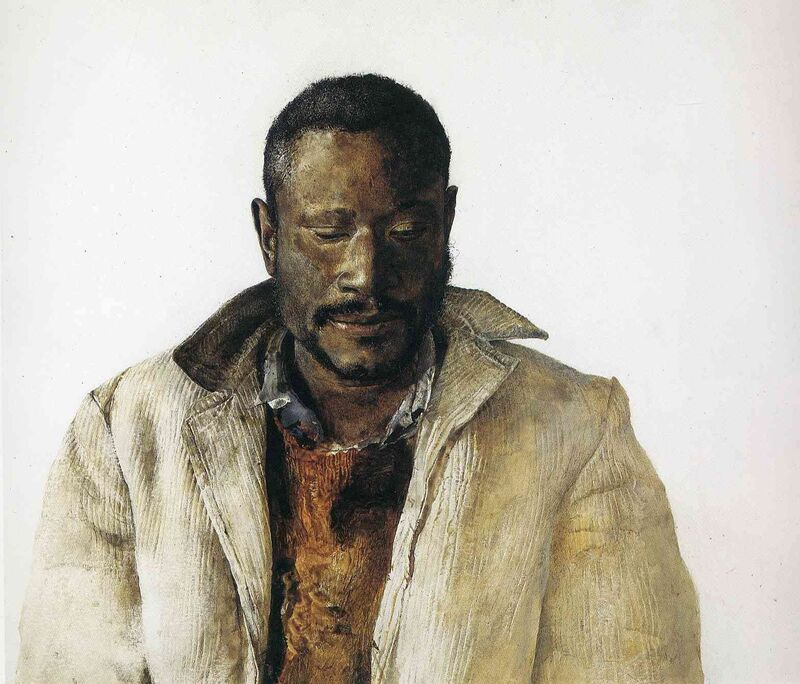 and the now iconic works—such as Winter 1946 (1946)—that were crafted after October 1945, when the death of his father caused a profound shift in Andrew Wyeth’s outlook on his art. 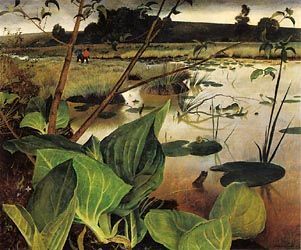 1950-1967: By 1950, Wyeth’s attention was focused on his own visceral responses to the landscape around his home in Chadds Ford, and Maine, most particularly the Christina Olson property and the coastline. Wyeth divided his time between these places. 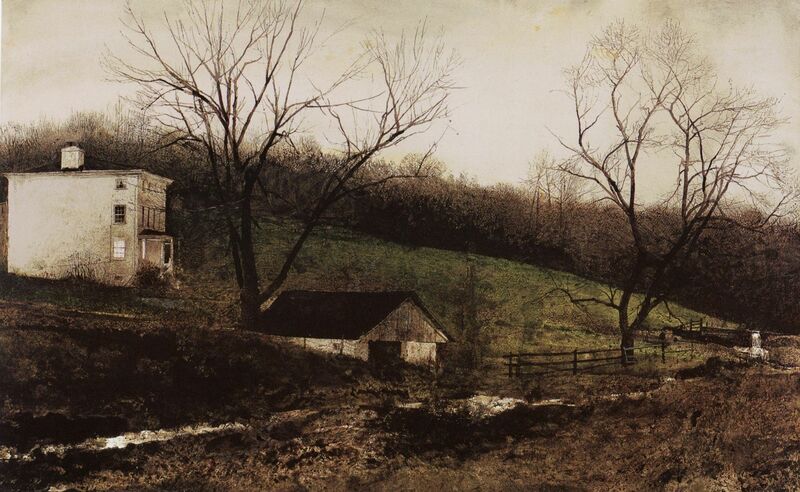 In Chadds Ford, he painted the Kuerner Farm (now part of the Brandywine River Museum of Art), which was long at the center of Wyeth’s world there and forever linked in his mind to the nearby railroad crossing where his father, N.C. Wyeth, had met a tragic death. He also painted friends who were the last of the Black community that had been established in Chadds Ford during the Civil War. 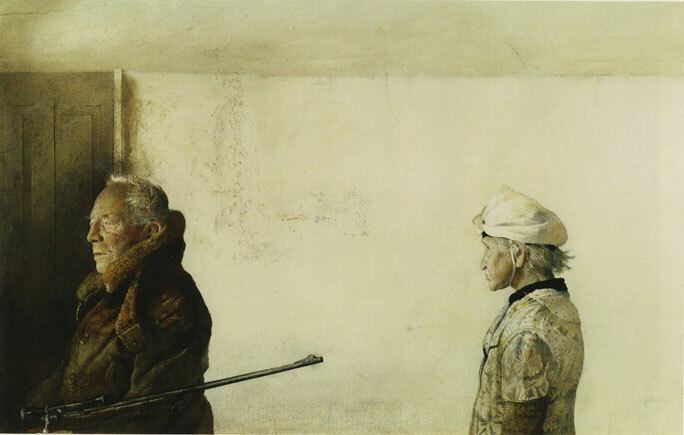 In Maine, Wyeth expressed his compelling emotional connection to the siblings Christina and Alvaro Olson and their house and property in Cushing. Willard Snowden (The Drifter, 1967), are also included. 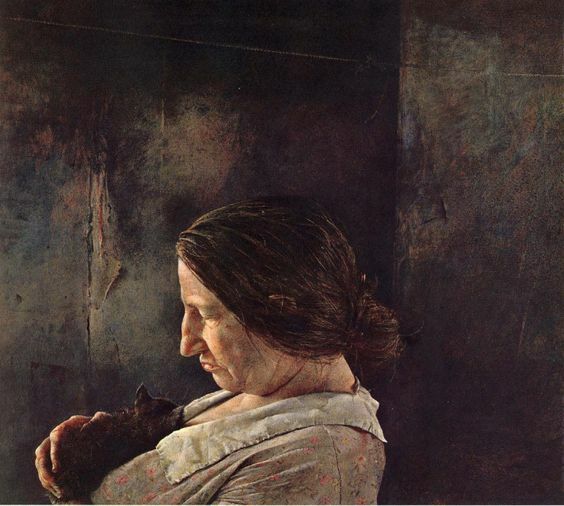 1989-2009: Beginning in 1989, Wyeth’s work became particularly self-reflective as he looked backward—partly in response to the critical backlash he experienced from the revelation of the Helga paintings. 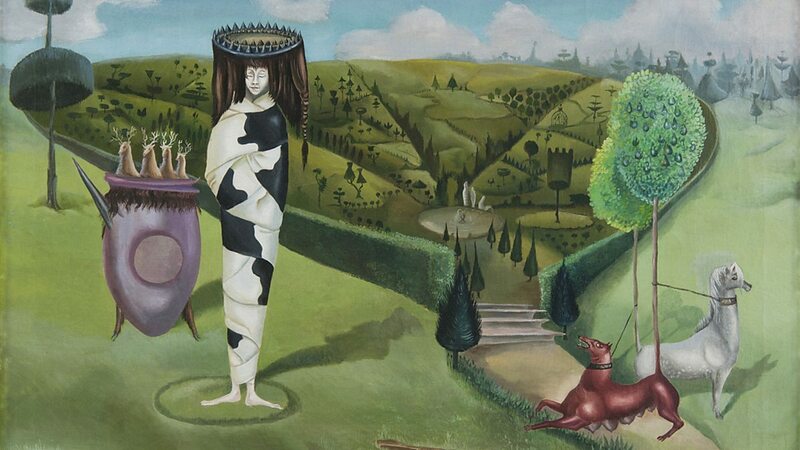 His late works are often infused with mystery and a surreal quality, recalling his earliest work and at times, in fact, directly referencing it. and Goodbye (2008), a painting completed just months before his death that has not been widely seen or published. The catalogue accompanying the exhibition will be co-published by Yale University Press, the Brandywine River Museum of Art and the Seattle Art Museum. It will provide a full visual document of the works in the exhibition, as well as lay out the first detailed timeline of Wyeth’s career. 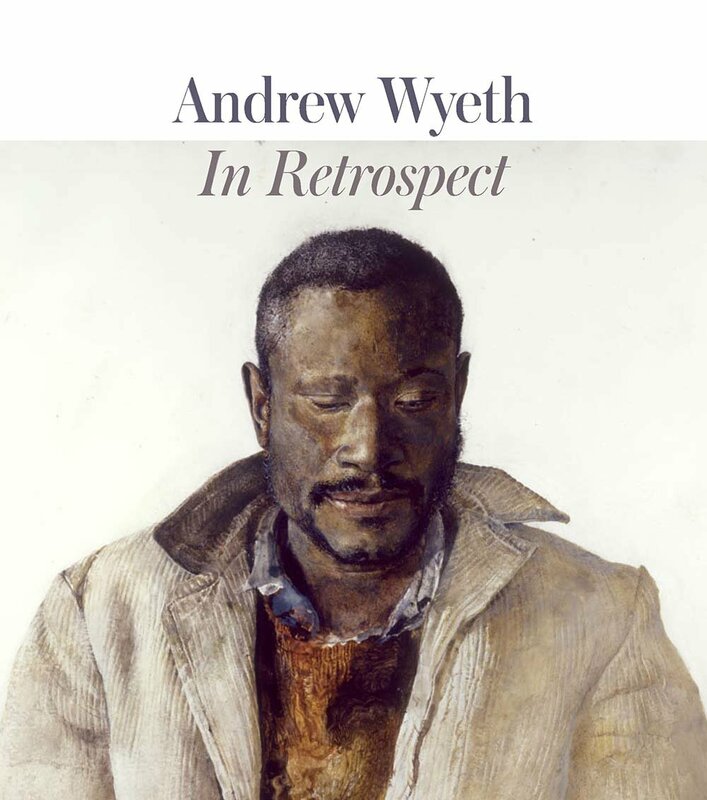 In addition to Patricia Junker’s insightful contextual analysis of the four periods described above, the catalogue will include seven provocative essays on key aspects of Wyeth’s work by scholars from both the United States and Japan. 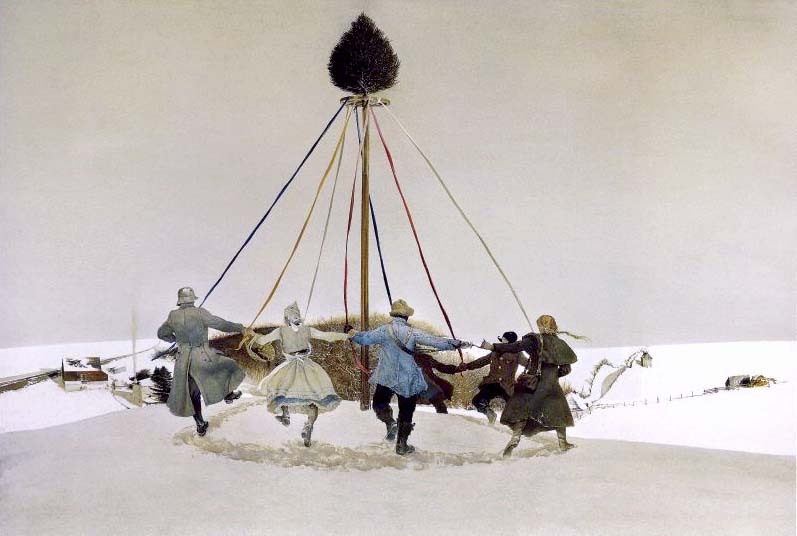 The catalogue is intended to be a foundation for subsequent Wyeth studies. The co-curators for the exhibition are Audrey Lewis, Curator, Brandywine River Museum of Art, and Patricia Junker, the Ann M. Barwick Curator of American Art at the Seattle Art Museum. The exhibition will be on view at the Seattle Art Museum from October 19, 2017 through January 15, 2018. 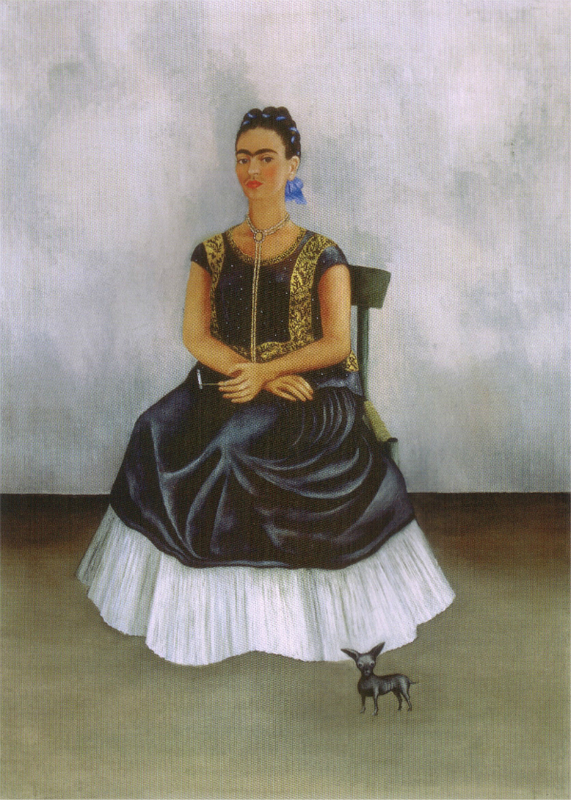 This March, the Dallas Museum of Art, in collaboration with the Mexican Secretariat of Culture, hosts the exclusive U.S. presentation of México 1900–1950: Diego Rivera, Frida Kahlo, José Clemente Orozco, and the Avant-Garde, a sweeping survey featuring almost 200 works of painting, sculpture, photography, drawings, and films that document the country’s artistic Renaissance during the first half of the 20th century. Curated by Agustín Arteaga, the DMA’s new Eugene McDermott Director, and the result of a combined cultural endeavor between Mexico and France, this major traveling exhibition showcases the work of titans of Mexican Modernism alongside that of lesser-known pioneers, including a number of rarely seen works by female artists, to reveal the history and development of modern Mexico and its cultural identity. On view from March 12 through July 16, 2017, México 1900–1950 will be enhanced in Dallas by the inclusion of key works from the Museum’s own exquisite collection of Mexican art, encompassing over 1,000 works that span across three millennia. 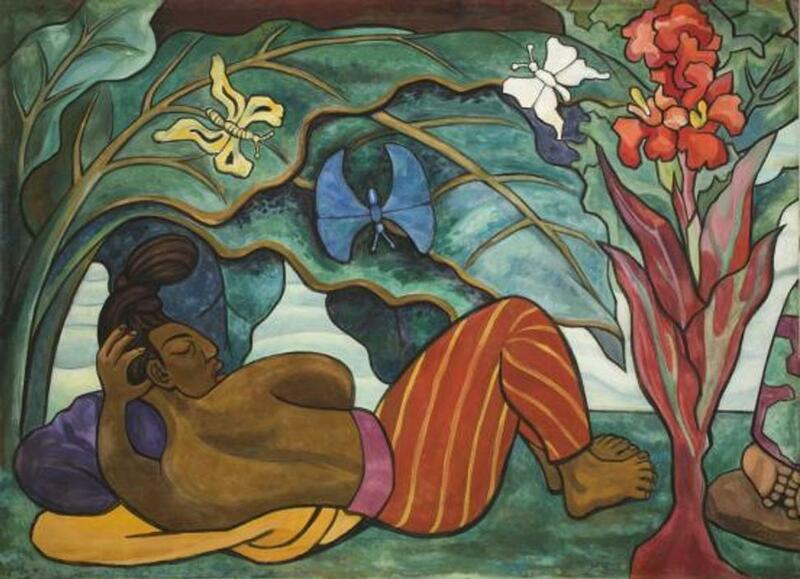 The exhibition, which premiered in October 2016 at the Grand Palais in Paris to both popular and critical acclaim, is organized by the Secretaría de Cultura/Instituto Nacional de Bellas Artes/Museo Nacional de Arte, México (MUNAL) and the Réunion des musées nationaux – Grand Palais (Rmn-GP) of France. Organized thematically and presented in both English and Spanish, México 1900–1950 reveals how Mexican 20th-century art is both directly linked to the international avant-garde and distinguished by an incredible singularity, forged in part by the upheaval and transformation caused by the Mexican Revolution in the early 1900s. 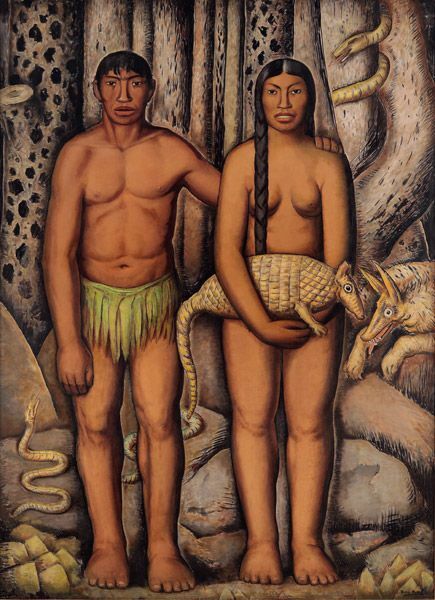 The exhibition begins with an introduction to the 19th-century imagery and traditions that pre-dated and, in turn, inspired Mexican Modernism, and includes work produced by Mexican artists living and working in Paris at the turn of the century. 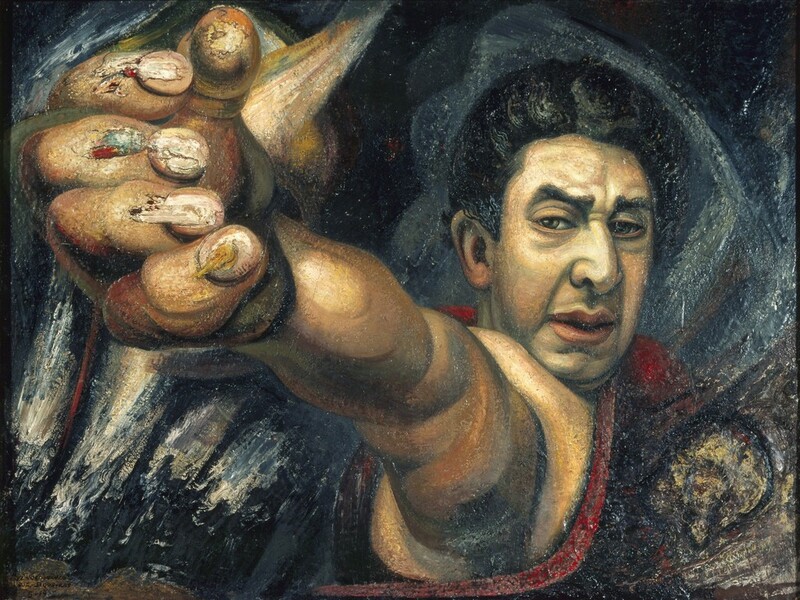 It then examines how the Revolution helped cement both a new national identity and a visual culture in Mexico, as embodied most famously by the murals of Rivera, Orozco and David Alfaro Siqueiros. 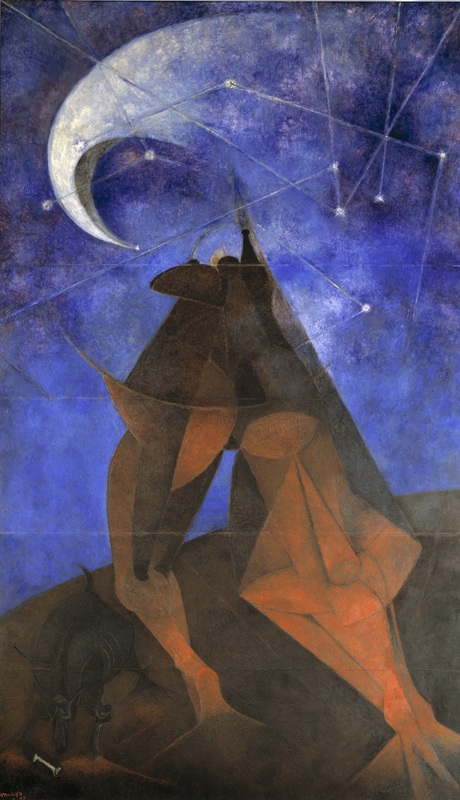 At the same time, México 1900–1950 goes beyond these mythic artists to reveal alternative narratives in Mexican art, including a significant emphasis on the work of female artists, who were supported by patrons like Dolores Olmedo and María Izquierdo. 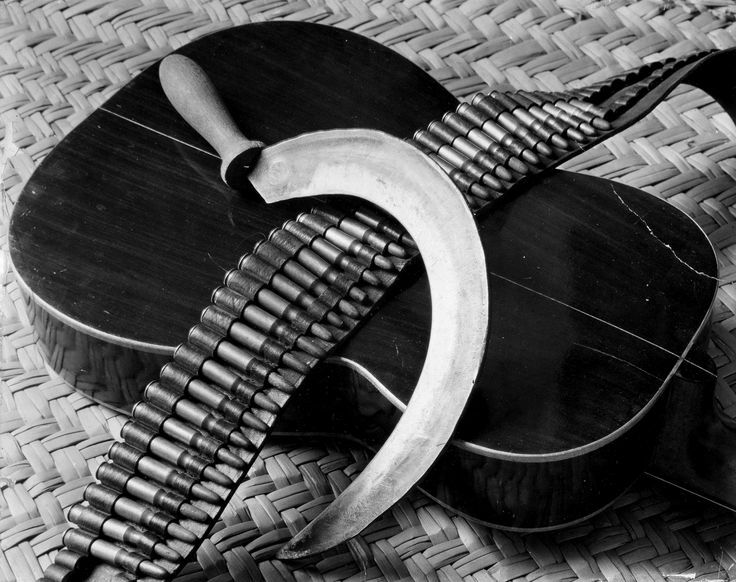 The thematic section “Strong Women” includes work by Frida Kahlo and her lesser-known but equally distinguished compatriots, including artists like Nahui Olin, photographer Tina Modotti, multidisciplinary artist Rosa Rolanda, and photographer Lola Álvarez Bravo, among others. Representing the response of Mexican artists to art movements from around the world with a cosmopolitan vision, the exhibition also features the artwork of abstract sculptor German Cueto, Manuel Rodríguez Lozano, Abraham Ángel, Roberto Montenegro and Rufino Tamayo. 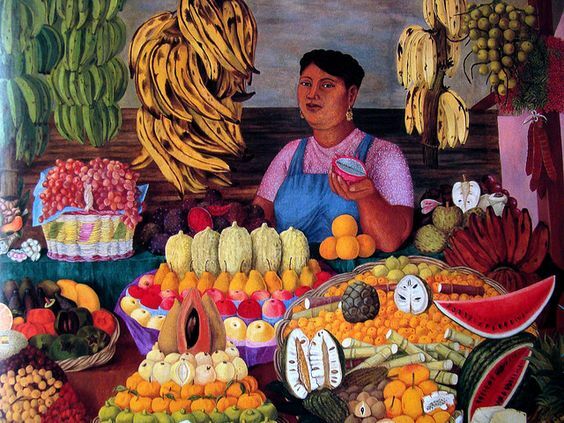 A final section reveals the cross-pollination specifically between American and Mexican artists and the resulting profound effect this had on art production in both countries. 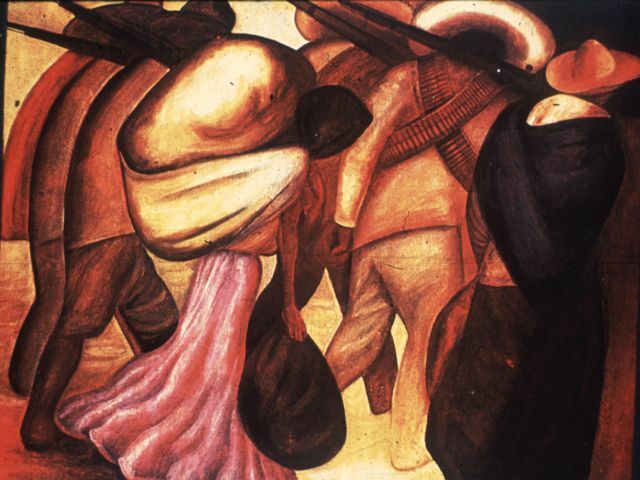 The Dallas presentation, in partnership with the Latino Center for Leadership Development and with support from Patrón Tequila, gathers perhaps for the first time in decades mural-sized works by Diego Rivera, José Clemente Orozco, Rufino Tamayo, Saturnino Herrán, Miguel Covarrubias, and Roberto Montenegro. Génesis, el Don de la Vida (Genesis, the Gift of Life), the iconic 60-foot-long glass mosaic mural by Miguel Covarrubias on permanent view at the DMA; originally created for another building in Dallas in 1954, the work is based on an ancient Mexican myth that four worlds preceded the world we currently live in, and incorporates imagery from numerous historic cultures in Central and North America. The exhibition will be accompanied by an illustrated catalogue, coordinated by the DMA and the Secretaría de Cultura/Instituto Nacional de Bellas Artes. 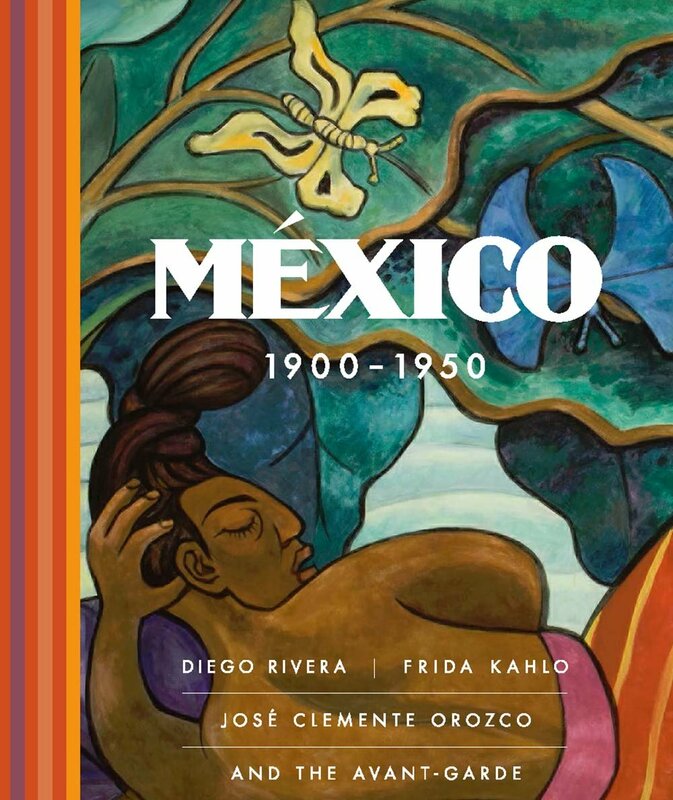 It is edited by Agustín Arteaga and available in both English and Spanish, a nod to the language of México 1900–1950 and a continuation of Dr. Arteaga’s initiatives to include multilingual materials across a variety of formats in DMA exhibitions. The book, translated from the original French is distributed by Yale University Press in English and by Ediciones El Viso in Spanish. Manet, Degas, Monet, Cézanne, van Gogh, Gauguin… the Glyptotek’s collection of French painting contains works by some of the greatest figures in art, just as it covers one of the most hectic epochs in art history. With over 200 works the exhibition displays the artistic diversity, which poured forth from France in the years 1809-1950. Through an original presentation of famous masterpieces and rarely seen major works the exhibition presents a visual narrative of 150 years of art which never manages to put down roots, and, for the same reason, is suffused with intensity and invention. From the Romantic Period up to the Second World War France was the meeting point for the most innovative vanguard of artists. The accelerating modernity and cultural broad-mindedness of Paris as well as the attraction of rural settings in the provinces was the perfect climate for the most pioneering European avant-garde. The exhibition’s paintings, drawings and small sculptures bear witness to the fact that art in this period was, at times, a savage quest for originality. These artists were driven by a powerful impulse not merely to keep pace with, but also to be able to anticipate and create the expression and form of the time. The exhibition, which is based exclusively on the Glyptotek’s own collection, spans the whole range in the development of art from the academic to the so-called modern. From the idealised painterly expression with its considerable technical wealth of detail, via the freer, experimental paintings, to full-blooded abstraction. In this way the exhibition sums up the many stylistic currents of the period: Realism, Romanticism, Naturalism, and, most of all, Impressionism. However, the development is far from linear and the art has a tendency to run rings around itself. 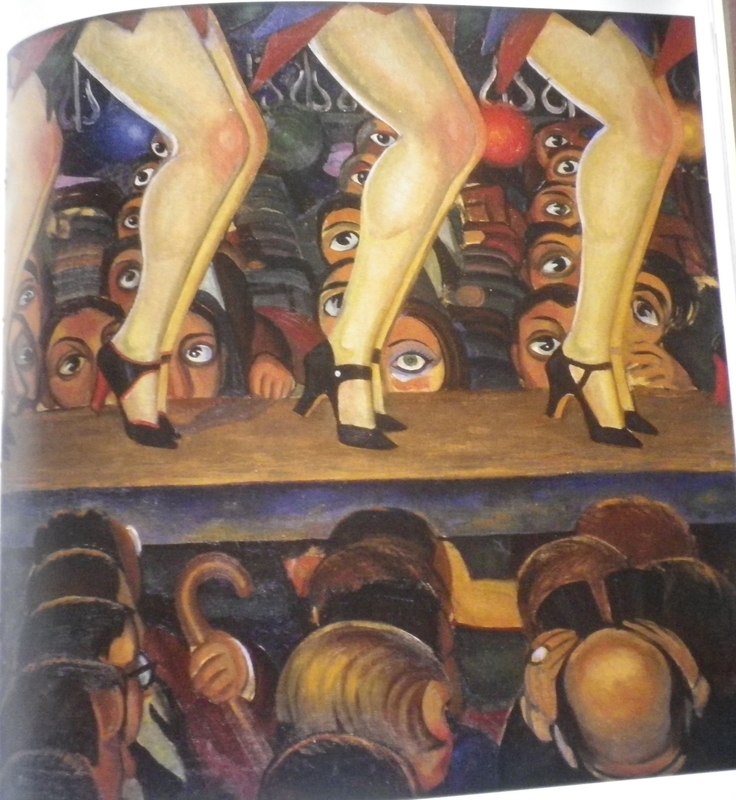 The artists typically worked outside art historical categories. They moved in and out of the various groups, drew inspiration from their travels and, all in all, worked more dynamically and unpredictably. The exhibition extends over three floors and juxtaposes artists, genres and techniques with chronology as the governing principle. It is, in fact, the chronology which briefly liberates painting from the constraints of being too closely associated with certain styles and has it assume the foreground as painting first and foremost. To further underline the free approach of the artists the exhibition is arranged according to a reverse chronology. Far from standing as a natural final destination, the modern painting of the 20th century becomes an introduction to a reversed stroll through the art of painting from the 19th century. Childe Hassam’s ‘Geraniums,’ painted in 1888/89, is part of The Hyde’s permanent collection and one of the work’s featured in its current show. When Childe Hassam returned to the United States after living in Paris for three years, he brought with him an American form of Impressionism. His Hyde House favorite Geraniums will be exhibited — along with the works of other American artists who found inspiration overseas — in American Artists in Europe: Selections from the Permanent Collection, which opened Tuesday, February 28, in The Hyde Collection's Whitney-Renz Gallery. The featured works are drawn from the Museum's permanent collection, highlighting American artists inspired by their travels. "Americans go as students or as established artists, but they both come back with distinctly American versions of movements they encountered in Europe," said Jonathan Canning, Curator of The Hyde. When, for example, Winslow Homer tired of painting Americans, he traveled overseas in 1881 in search of strong-willed women exuding natural beauty. 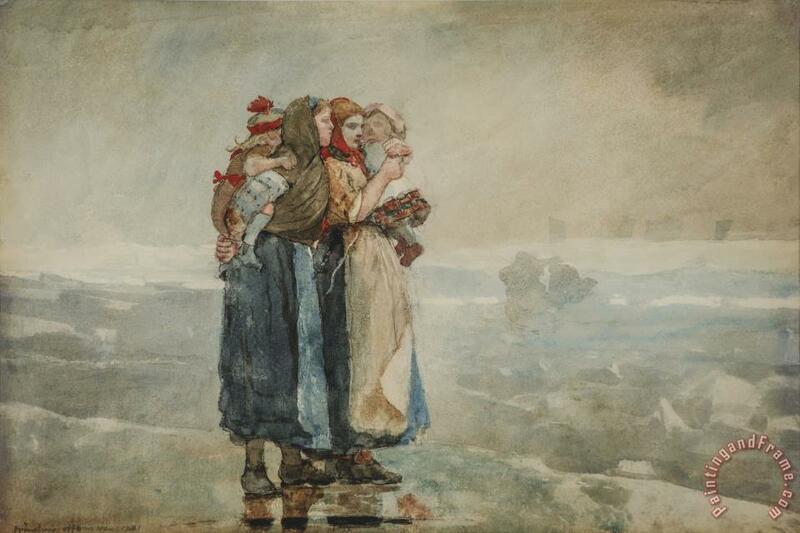 The revered painter found his muses on the rough shores of Cullercoats, England. He came back to the States with the subjects that would come to dominate his later years, fisherfolk and the power of the sea. Before the Civil War, America lacked the cultural equivalents of artists' cafes, salons, and the Bohemian lifestyle that made Europe the center of Western culture. "Artists traveled wanting to see Europe's great cities, art collections, and monuments," Canning said. "It wasn't until after the war that Americans started to develop art academies and cultural institutions of their own." and Leonard Freed, who traveled in Europe and Africa before settling in Amsterdam to photograph its Jewish community; among others. American Artists in Europe runs through June 11 in Whitney-Renz Gallery. The American photographer William Eggleston (1939, Memphis Tennessee, US) is widely considered one of the leading photographers of the past decades. He has been a pioneer of colour photography from the mid-1960s onwards, and transformed everyday America into a photogenic subject. In William Eggleston – Los Alamos, Foam displays his portfolio of photographs that were taken on various road trips through the southern states of America between 1966 and 1974. 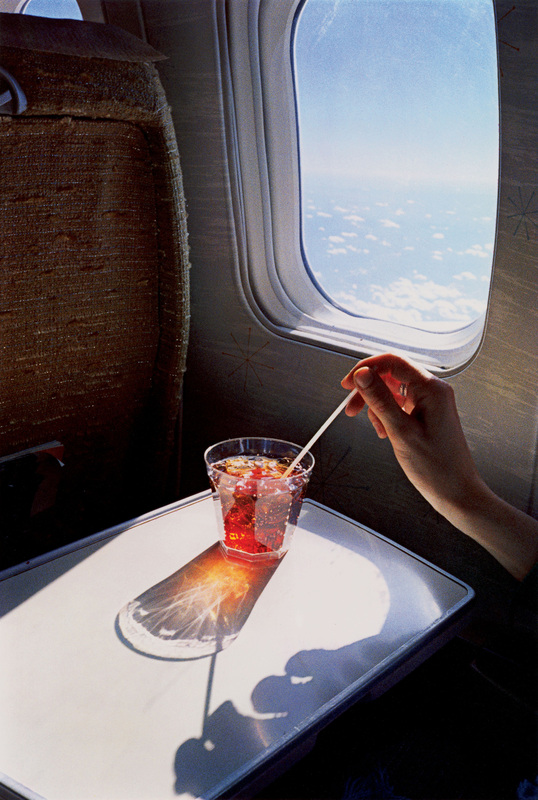 The exhibition includes a number of iconic images, amongst which Eggleston’s first colour photograph. Los Alamos starts in Eggleston’s home town of Memphis and the Mississippi Delta and continues to follow his wanderings through New Orleans, Las Vegas and south California, ending at Santa Monica Pier. During a road trip with writer and curator Walter Hopps, Eggleston also passed through Los Alamos, the place in New Mexico where the nuclear bomb was developed in secret and to which the series owes its name. The over 2200 images made for Los Alamos were originally intended to be published in parts, but were forgotten over the years. The photographs were rediscovered almost 40 years after the project started. They were published and exhibited for the first time in 2003. The vibrant photographs of traffic signs, run-down buildings and diner interiors distinctly betray the hand of the wayward autodidact. His early work evidences his penchant for the seemingly trivial: before the lens of Eggleston’s ‘democratic camera’, everything becomes equally important. Eggleston began Los Alamos ten years before his contested solo exhibition at MoMA in 1976, which placed colour photography on the map as a serious art form. At the time, colour photography in the fine arts was regarded as frivolous, or even vulgar. It earned Eggleston the scorn of many. 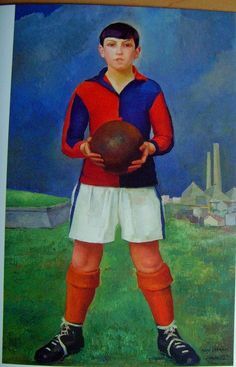 However, this did not stop him from experimenting with the no longer used dye-transfer process, a labour-intensive and expensive technique that was mainly used in advertising photography. The process allowed the photographer to control the colour saturation and achieve an unparalleled nuance in tonality; a quality that also characterizes the 75 dye-transfer prints exhibited at Foam.